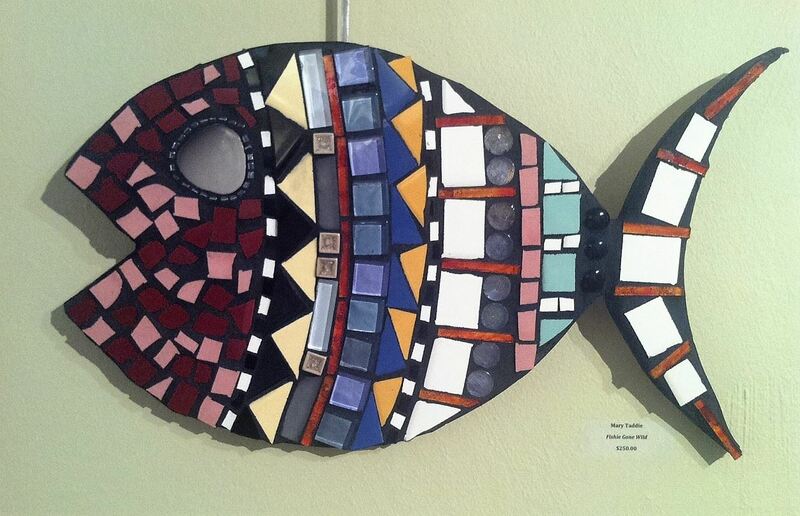 Salem Arts Association is home to many talented artists whose artwork can be found in our own gallery. It's also true that Salem Arts members work can be seen throughout New England. This month our neighbors at Marblehead Arts Association will feature three of our Salem Arts Association members in their galleries and in the artisan shop. On display starting August 13 through September 25 in the galleries of Marblehead Arts are two feature solo exhibitions by our own Karen Hosking and Mary Taddie. Peggy Farrell's work is featured in the Artisan Shop. Be sure to attend the opening reception this Sunday, August 14, 2-4 pm. In addition to Salem Arts Karen is a member of a number of local arts associations. 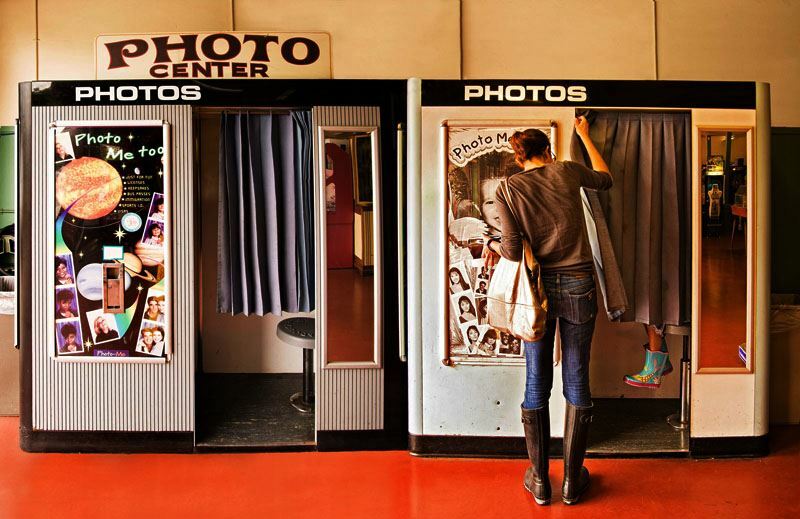 Her photographs have won numerous awards in local and regional competitions and shows. She is interested in a variety of photographic styles including creative, black and white, scenic, architectural and fine art. Her goal in photographing is to engage with the viewer and capture a moment or a scene in a way that allows the viewer to see it in a new way. Mary Taddie brings her skill in the arts of Ceramic Tile, Marble, and Italian Smalti techniques to her solo exhibition entitled "Catching The Wave". Moved by the works of ancient Italian and Byzantine artisans, Mary Taddie creates unique and exciting Mosaic Wall Art and jewelry. 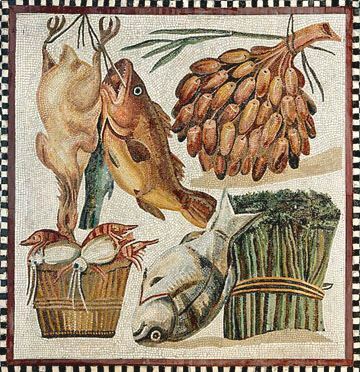 Her creations use the same techniques and Venetian glass used over 500 years ago and employ a range of mosaic styles from ancient to modern. Mary’s finished pieces can be jewel like pendants as small as one square inch or murals and functional art as large as fifty square feet. She nips, chisels and cuts recycled material like travertine, marble, ceramic tile and slate using her specialty tools and wet saws while experimenting with adhesives, substrates and grouts. 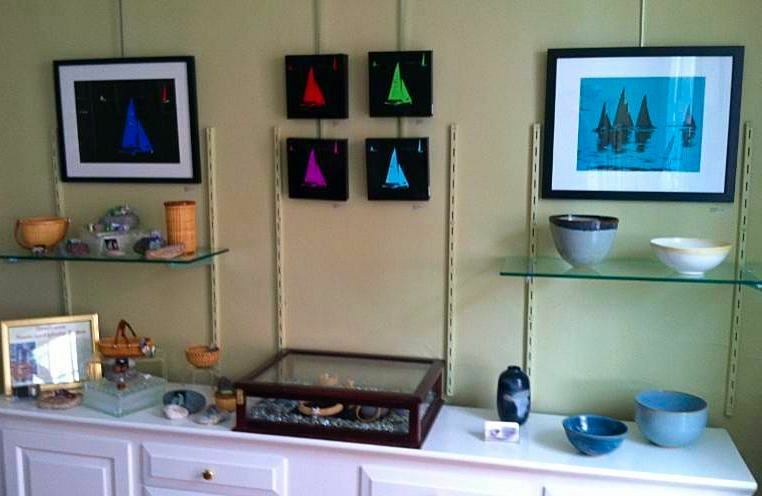 Peggy Farrell, Salem Arts member and Board Member, is currently featured in the Artisan Shop. Her work in the shop includes her photography and cards. The Marblehead Arts Association is located in the historic King Hooper Mansion, at 8 Hooper Street, Marblehead. Six galleries of exhibits by association members and guest artists change every six weeks and education programs and special events are offered throughout the year. The MAA Artisan Shop features one-of-a-kind crafts and fine art including jewelry, pottery, glassworks and textiles by 7 of our artisan members at affordable prices under $250. New work for sale by 7 member artisans turns over every three months. The Mansion is available for private parties, meetings, weddings and other events. MAA winter hours are Wednesdays through Fridays and Sundays noon – 5pm and Saturdays 10 am – 5 pm. For more information on this exhibit as well as our exhibit calendar, events, programs and classes, please call 781-631-2608 or visit our website; www.marbleheadarts.org. Mayor Kimberley Driscoll and the Salem Public Art Commission (PAC) announce “TradeWind,” a public art installation in Derby Square, running July through September, 2016. A call for artists and designers for this site specific installation around Old Town Hall and Derby Square brought in eighteen proposals. The team of op.AL, a trans-disciplinary practice from New York, formed by Jonathan A. Scelsa + Jennifer Birkeland, was selected by a PAC appointed Artist Selection Panel. A talk by the artist is scheduled for Saturday, July 9th at 4pm on site in Derby Square with an opening reception at 6pm in Old Town Hall. Both events are free and open to the public. Water and wind built Salem. Water carried the fishermen in their boats to the shores of Salem to settle. Wind enabled Salem’s merchant ships to sail across the ocean. From these ships of the East India Company treasures and trade were brought and sold at Town Hall, building a seaside village into a city. To honor and celebrate the role that these elements and Town Hall have played in the growth of the city, we have created a dynamic installation of spinning houses, combined to form the shape of Salem Town Hall. These individual houses are made in two colors: Caribbean Blue and Saffron Yellow. The blue invokes the exotic waters of far-flung lands that provided importers with treasures and spices – such as jewelry and saffron – referenced in the yellow houses. In the daytime these objects will showcase the fluid and changeable effects of wind while serving as a tribute to the fact that cities only exist as the sum of their parts. At night, they are lit from within projecting onto the face of town hall, giving observers the privilege of glimpsing something that predecessors could not: growth. 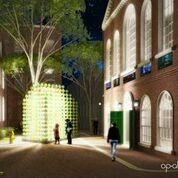 This installation is both a nod to the past and a glimpse towards the future and a celebration of generations of individuals who have built and continue to build Salem. op.AL is a trans-disciplinary New York practice, formed by Jonathan A. Scelsa + Jennifer Birkeland, seeking creative design solutions utilizing optics as a means of engaging the oppositions between Architecture and Landscape resulting in design solutions that strive to dis-integrate the subject-object relationship conventionally within the two disciplines. Jonathan is a Design Critic in the department of Architecture for University of Pennsylvania + the Rhode Island School of Design and Jennifer is a Visiting Professor at Pennsylvania State University in the Department of Landscape Architecture. Stephanie Imbeau is an installation artist based in New York whose practice investigates the way individuals seek community, personal security and a place to belong. She uses representations of protective structures as anthropomorphisms to explore this universal human impulse. These basic forms of shelter also provide the framework for a conceptual mapping of the barriers drawn to create safety and claim meaning using physical spaces. Hiroshi Jacobs is an artist and architect living and working in Washington, DC. He is a Lecturer in Architecture at The Catholic University of America, an architect with STUDIOS architecture, and the founder of HiJAC, a trans-disciplinary design & research collaborative. His designs and artwork have appeared in numerous publications and exhibitions, including Surface Magazine, Businessweek, Harvard GSD Platform, DesCours New Orleans, La Biennale di Venezia, (e)Merge, and the Harvard Arts First Festival. Hiroshi was selected as an outpost of OfficeUS for the American pavilion at the 2014 Venice Biennale, and was recently highlighted in DC Modern Luxury’s Best of DC 2015 Issue. Hiroshi has held academic faculty positions at Tulane University and in the Career Discovery program at Harvard’s Graduate School of Design. The team would like to thank and credit the following individuals and institutions who generously supported the construction of the project: District Design Lab, The Rhode Island School of Design Department of Architecture, The City College of New York Architecture Department, Andrea Kelly, Giacomo Sartorelli, William Allured, and Erin Wythoff. 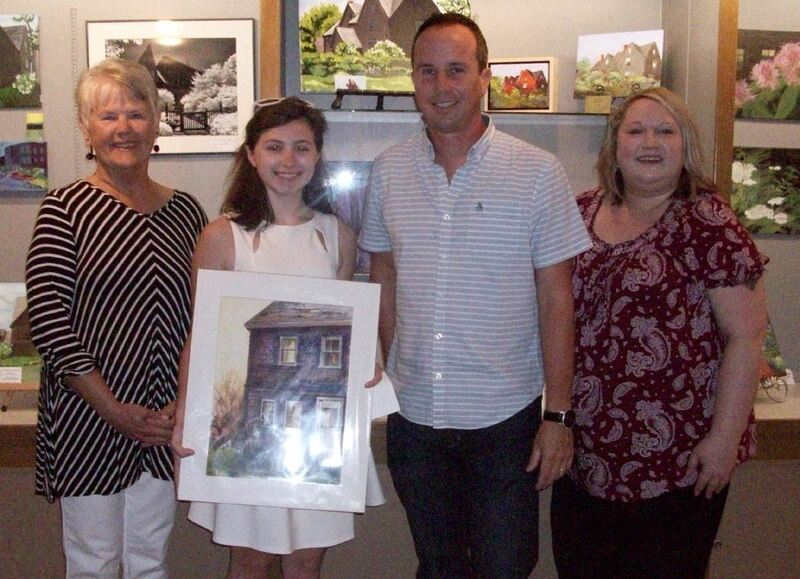 Join award winning American artist, Mark Shasha for two days of painting. The workshop begins in the galleries of the King Hooper Mansion to view and discuss Mark’s work. Mark will answer “how to” questions and speak about his methods. After a lunch break, proceed outdoors to either Chandler Hovey Park on Marblehead Neck or Fort Sewall in the historic district, for an afternoon “Paint Out”. Mark will provide guidance and constructive criticism as artists work from nature. Visit the calendar listing on www.marbleheadarts.org for more information and a list of materials. Gallery Hours: Thursday – Sunday, 12:00 – 6:00 pm. reflects this philosophy with its "Art in Action – Connecting Communities" focus this season, by hosting a groundbreaking collaboration with Gloucester's marine conservation/research group Ocean Alliance, now headquartered in Gloucester's iconic Paint Factory, and historic Rocky Neck Art Colony. Supporting the Ocean Alliance mission to protect and preserve our oceans and marine life and North Shore Arts Association and Rocky Neck Art Colony’s mission of supporting the arts, an "Art Exhibition of the Sea and Science" will be on display June 17 through July 30 in the galleries of NSAA. 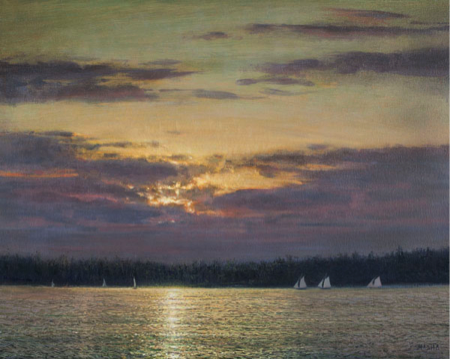 Although works of all genres will be on display, the main focus will be works depicting the sea and Cape Ann. A very unique component of the exhibition will be a show and silent auction of works painted on old roofing slates removed from the historic Paint Factory building. These historic slates donated to NSAA by non-profit Ocean Alliance provide the substrate used by NSAA Artist Members to create original paintings, each approximately 12"x24" depicting a myriad images. Bids for the silent auction may be placed June 17 through July 30 by visiting or contacting NSAA. One hundred per cent of silent auction proceeds will go to fund the ongoing restoration of the NSAA's gallery building and Ocean Alliance's Paint Factory headquarters. The collaboration also offers an extraordinary series of Ocean Alliance and Rocky Neck Art Colony lectures and performances. This special programing was made possible through partial funding by the Massachusetts Cultural Council. The first of the series will be marine conservation/research group Ocean Alliance presenting a lecture "Why Whales?" by CEO Dr. Iain Kerr on Sunday, June 26th, 12:30-1:30pm followed by a reception, open free to the public 2-4pm. A dynamic performance/poetry reading, "Sea Change: Reversing the Tide" will be presented by President of Ocean Alliance Dr. Roger Payne - whose profound discovery of whale songs has been a major force in their protection - and his wife, noted British actress Lisa Harrow on Thursday, July 7th at 7pm. Rocky Neck Art Colony President and arts and marine conservation advocate Karen Ristuben will present a lecture “Intersection of Marine Science, Conservation, Activism and Art on Saturday, July 23rd 3pm. All lectures and performances are free with a suggested donation of $5. To learn more about these three iconic non-profits visit www.nsarts.org, www.whale.org and rockyneckartcolony.org. Dr. Roger Payne states, "I am so disappointed that the Arts and Sciences are taught separately – both the Arts and the Sciences lose. They should be co-mingled." Ocean scientist Payne embodies the best of the Arts and Sciences functioning together to do something probably neither could have done separately. Ocean Alliance CEO Iain Kerr shares, "Because Dr. Payne is a musician. . . because he is an artist/scientist, his training allowed him to identify, and make the most profound discovery about humpback whales. That whales sing songs!" Prior to his discovery in 1967, along with Scott McVay, whale sounds were a mystery. Payne knew, however, that "a song is a rhythmically repeated collection of notes" and was able, because of his music training, to identify the particular songs of individual whales that he later confirmed can be heard over thousands of miles of ocean. Having worked aboard the sloop "Clearwater" in support of Pete Seeger's efforts to clean up the Hudson River in New York, Payne is considered a pioneer in his field. In the hope of sharing the work of artists/scientists, recordings of whale songs were placed aboard American Satellites Voyager I and II. Drs. Payne and Kerr have also stimulated interest in conserving our oceans and marine life by testifying before congress and presenting before the United Nations. What is the most consequential contribution of science in the past 100 years? Is it E=mc2, the structure of DNA, decoding the human genome, plate tectonics, the computer revolution, putting a man on the moon, the development of nuclear weapons? None of those directly affects the lives of every human being on earth—most indigenous peoples are simply unaware of all of them. However, respect for the hundreds of species that make the world habitable for us, and with which we interdepend is utterly consequential. Indigenous people were first to guess at it but scientific discovery during the past 50 years has proved it. And the consequence is that discovery is—if we ignore the destruction of the wild world until it can no longer keep the world habitable, our species will not survive. that the most consequential scientific discovery of the past 100 years is the realization that our species’ survival requires that we attend not just to our own wellbeing but to the wellbeing of the entire web of Life—nothing else we can ever do will be nearly as consequential as understanding that point. The audience emerges with a clear understanding of humanity's role in the natural world and of the urgency of our need to start living sustainably. Since 2004, Roger and Lisa have presented SeaChange:Reversing the Tide to audiences in universities, film festivals, schools, churches, conferences, libraries and other public spaces, off-Broadway, the UN, and in people’s living rooms, throughout the US, as well as in New Zealand and the UK. Currently, a team of New Zealand/Canadian documentary makers are raising the funds from international sources to make a film of the piece, which they are calling Pale Blue Dot after Carl Sagan’s book, an extract from which are the last words of SeaChange. "SeaChange moves its viewers. The strength of its ecological convictions derives from well-marshalled facts of the reality of our despoilment of the planet, and the emotional impact of the poetry the piece uses. Most importantly, Harrow and Payne turn away from despair, to what is to be done." "Thank you, both of you, for that haunting and lovely stage piece. You had me thrumming all the way home." "I think of our planet as Planet Ocean, not Planet Earth because almost three quarters of the planet is ocean." A self described adventurer who loves ocean science, Kerr was granted a Doctor of Humane Letters degree from the University of Southern Maine in honor of his 20 years of ocean research in over 21 countries. On a trip out of Gloucester harbor in 1993 on a whale watch boat he saw the Paint Factory. Recognizing that such an iconic building, with its long maritime history, might capture the hearts and minds of people thereby stimulating their interest and involvement in ocean and whale conservation, he realized it would be a valuable place to headquarter Ocean Alliance. 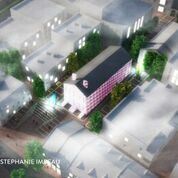 As a result, the organization contacted the Annenberg Foundation which ultimately provided all the funds necessary to purchase the Paint Factory. Kerr emphasizes that, since the building is mortgage free, all donations go to the ongoing restoration of the Paint Factory buildings. The OA organization is a pioneer in developing benign research tools for studying our oceans, the most recent iteration being drones – which they have dubbed "Snotbots" – which gather specimens from the spray spouted through the blow holes of whales. Award winning actor Patrick Stewart has long been a friend to Ocean Alliance and was instrumental in garnering funds for the "Snotbot" research program. This research method is hailed for its non-invasive approach to studying the health of whale populations. When asked what is meant by "Alliance" in the OA title, Kerr said it "reflects the idea that, along with collaboration from many other scientific organizations, all of humanity needs to be allied to preserve our oceans." Finding Gloucester reminiscent of the small fishing village in South West England where he grew up, Kerr and his wife chose to make their home East Gloucester. After a conversation in 2009 with Iain Kerr, CEO of Ocean Alliance, about the challenges of preserving our oceans, Ms. Ristuben became actively involved using her artistic energies to build awareness about marine conservation. Fascinated with the qualities of reflectivity and transparency, she adopted working in glass as her artistic medium. Then, looking out at the ocean from her Gloucester home she "realized how reflective and transparent" the water is. Also she began noticing the accumulation of plastics on the sand in front of her house. Inspired to take action, Ristuben developed a dynamic performance/lecture using the arts – music, photography and her own videos – creating an art piece as a vehicle to communicate information about the toxic effects of plastics pollution on our oceans. She states, "If there's something in the world that needs attention - if you present it within an aesthetic framework – it becomes compelling, and they will be engaged and more likely to learn and become an agent for change. Without an aesthetic element the offering is two dimensional. Presenting a performance translates the issues through artistic media which then asks a viewer to be a part of it, to experience it, and be touched by it – which then leads to audiences to inquire - what can I do? Ristuben suggests that people get involved through something that they know and care about that surrounds them. She was surrounded by the sea. She says, "One can be most effective when talking about something from your own perspective. It allows others to do the same. It gives permission to bring your own life into your art." A longtime resident of Rocky Neck and current Rocky Neck Art Colony President, Ristuben sees new excitement and possibilities for forming new working partnerships, especially under the banner of the Cultural Districts, between local arts and scientific communities on Cape Ann. The Kensington-Stobart Gallery is pleased to feature original works by North Shore native, David Shear. Recognizing his artistic inclinations early on, David's mother introduced him to all of the area's finest art museums and inspired him to pursue his artistic talents to include painting and sculpture. 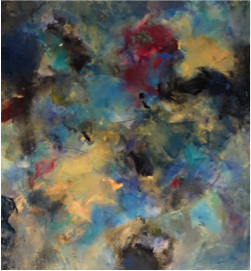 He has trained under impressionist Kay Orr and has attended workshops on advanced abstract painting at centers such as the Woodstock School of Art. He has collectors nationwide; and his work is exhibited in many fine homes and in commercial settings such as law firms, medical centers, restaurants, and designer galleries. He has enjoyed representation by fine art galleries in Dallas, Cincinnati, Oklahoma City and Santa Fe. You are invited to meet the artist by attending the upcoming open house where you will be able to appreciate his remarkable talent. Gallery Hours: Monday through Friday, 10am-5pm; Saturday and Sunday, 12pm-5pm. For more information, call The Kensington-Stobart Gallery at 978-825-0022. This event is free and open to the public. Salem Arts Association is pleased to announce its internship program open to any Salem State student or graduate who is interested in working for and learning about a non-profit arts organization, including exhibitions, educational workshops, and events in the community. Internships are a great opportunity to network while getting professional experience and references for future work opportunities. SAA has internship openings for Summer 2016, as well as Fall 2016 and Spring 2017. Please see the information below. For any questions, contact Mary Melilli, Chair of Art + Design, Salem State University (mmelilli@salemstate.edu) or email us at Internship@salemArts.org. • Submit a resume outlining your experience and work history. • Submit a cover letter briefly explaining why you’d like to be a Salem Arts Intern and if you have any relative expertise or knowledge. • Indicate whether you are seeking a Summer, Fall, or Spring internship. • State which afternoon(s) you are available to be present at the gallery: Thursday, Friday, Saturday, or Sunday. • Internships are non-paying, however complimentary one-year memberships will be granted to all interns. Membership benefits include being able to sell your art through SAA and participate in exhibitions, events, and workshops. • Internship duties include overseeing the exhibition space and art sales on Essex Street one or two times a week from 12noon to 6pm, preferably on Saturdays and possibly Thursday, Friday, or Sundays. The internship also includes hands-on experience in a chosen area of expertise, such as graphic design, curating shows, web design, membership drives, public relations, event coordination, education, marketing, etc. • All interns will report to the Salem Arts President and/or work closely with a Salem Arts supervisor/mentor to tailor an internship that matches career interests. • Interns work for 120 hours total in a given three-month period. • Internships can be used to receive academic credit, provided all University criteria are met. Internships that receive 3 credits have the same responsibilities as internships that don’t receive credit. • Only current Salem State University students and/or graduates are eligible to apply. Please join us Tuesday evening, May 24, 5:30 - 8 pm at the Lynn Museum/LynnArts, as we welcome creators from around the North Shore to downtown Lynn for an evening of networking and information on how cultural districts like ours are contributing to economic development in Gateway Cities. P.S. Please feel free to share this invitation with anyone who may be interested. CEANS - Creative Economy Association of the North Shore was founded to bring the emerging creative sector on the North Shore together in a more intentional way for education and advocacy. They have developed a particular interest in Lynn's growth as a hub for creative activity, particularly in the Downtown Lynn Cultural District. This is exhibit news from Corbino Gallery, at BrushStrokes Studio, 14 Prospect Street, Marblehead, MA 01945. We are excited about starting off the season with a Michael D. Schrenko EXHIBIT From May 5th - May 29th! Dr Schrenko, a primary care physician, who offers a mélange of new age expressionism with a variety of different mediums-oil, acrylic, watercolor, bronze and silver. The reception is this Sunday, May 15th from 3PM – 5PM. In addition, Judy Schmid will be exhibiting in the lower gallery. 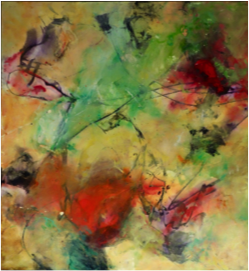 She will be displaying her new abstract and portrait encaustic work.